This article contains Indic text. Without proper rendering support, you may see question marks or boxes, misplaced vowels or missing conjuncts instead of Indic text. Tamil is written in a non-Latin script. Tamil text used in this article is transliterated into the Latin script according to the ISO 15919 standard. Tamil (/ˈtæmɪl/; தமிழ் Tamiḻ [t̪ɐmɨɻ], pronunciation (help·info)) is a Dravidian language predominantly spoken by the Tamil people of India and Sri Lanka, and by the Tamil diaspora, Sri Lankan Moors, Douglas, and Chindians. Tamil is an official language of two countries: Sri Lanka and Singapore and official language of the Indian state Tamil Nadu. It has official status in the Indian state of Tamil Nadu and the Indian Union Territory of Puducherry. It is used as one of the languages of education in Malaysia, along with English, Malay and Mandarin. Tamil is spoken by significant minorities in the four other South Indian states of Kerala, Karnataka, Andhra Pradesh and Telangana and the Union Territory of the Andaman and Nicobar Islands. It is one of the 22 scheduled languages of India. Tamil is one of the longest-surviving classical languages in the world. A. K. Ramanujan described it as "the only language of contemporary India which is recognizably continuous with a classical past." The variety and quality of classical Tamil literature has led to it being described as "one of the great classical traditions and literature of the world". A recorded Tamil literature has been documented for over 2000 years. The earliest period of Tamil literature, Sangam literature, is dated from ca. 300 BC – AD 300. It has the oldest extant literature among Dravidian languages. The earliest epigraphic records found on rock edicts and 'hero stones' date from around the 3rd century BC. More than 55% of the epigraphical inscriptions (about 55,000) found by the Archaeological Survey of India are in the Tamil language. Tamil language inscriptions written in Brahmi script have been discovered in Sri Lanka and on trade goods in Thailand and Egypt. The two earliest manuscripts from India, acknowledged and registered by the UNESCO Memory of the World register in 1997 and 2005, were written in Tamil. In 1578, Portuguese Christian missionaries published a Tamil prayer book in old Tamil script named Thambiran Vanakkam, thus making Tamil the first Indian language to be printed and published. The Tamil Lexicon, published by the University of Madras, was one of the earliest dictionaries published in the Indian languages. According to a 2001 survey, there were 1,863 newspapers published in Tamil, of which 353 were dailies. Tamil belongs to the southern branch of the Dravidian languages, a family of around 26 languages native to the Indian subcontinent. It is also classified as being part of a Tamil language family that, alongside Tamil proper, includes the languages of about 35 ethno-linguistic groups such as the Irula and Yerukula languages (see SIL Ethnologue). According to linguists like Bhadriraju Krishnamurti, Tamil, as a Dravidian language, descends from Proto-Dravidian, a proto-language. Linguistic reconstruction suggests that Proto-Dravidian was spoken around the third millennium BC, possibly in the region around the lower Godavari river basin in peninsular India. The material evidence suggests that the speakers of Proto-Dravidian were of the culture associated with the Neolithic complexes of South India. The next phase in the reconstructed proto-history of Tamil is Proto-South-Dravidian. The linguistic evidence suggests that Proto-South-Dravidian was spoken around the middle of the second millennium BC, and that proto-Tamil emerged around the 3rd century BC. [citation needed] The earliest epigraphic attestations of Tamil are generally taken to have been written shortly thereafter. Among Indian languages, Tamil has the most ancient non-Sanskritic Indian literature. Scholars categorise the attested history of the language into three periods: Old Tamil (300 BC–AD 700), Middle Tamil (700–1600) and Modern Tamil (1600–present). In November 2007, an excavation at Quseir-al-Qadim revealed Egyptian pottery dating back to first century BC with ancient Tamil Brahmi inscriptions. John Guy states that Tamil was the lingua franca for early maritime traders from India. Mangulam Tamil Brahmi inscription in Mangulam, Madurai district, Tamil Nadu dated to Tamil Sangam period c. 400 BC to c. 200 AD. Explanation for Mangulam Tamil Brahmi inscription in Mangulam, Madurai district, Tamil Nadu dated to Tamil Sangam period c. 400 BC to c. 200 AD. According to Hindu legend, Tamil or in personification form Tamil Thāi (Mother Tamil) was created by Lord Shiva. Murugan, revered as the Tamil God, along with sage Agastya, brought it to the people. The earliest extant Tamil literary works and their commentaries celebrate the Pandiyan Kings for the organization of long-termed Tamil Sangams, which researched, developed and made amendments in Tamil language. Even though the name of the language which was developed by these Tamil Sangams is mentioned as Tamil, the period when the name "Tamil" came to be applied to the language is unclear, as is the precise etymology of the name. The earliest attested use of the name is found in Tholkappiyam, which is dated as early as 1st century BC. Southworth suggests that the name comes from tam-miḻ > tam-iḻ "self-speak", or "one's own speech". (see Southworth's derivation of Sanskrit term for "others" or Mleccha) Kamil Zvelebil suggests an etymology of tam-iḻ, with tam meaning "self" or "one's self", and "-iḻ" having the connotation of "unfolding sound". Alternatively, he suggests a derivation of tamiḻ < tam-iḻ < *tav-iḻ < *tak-iḻ, meaning in origin "the proper process (of speaking)". Old Tamil is the period of the Tamil language spanning the 3rd century BC to the 8th century AD. The earliest records in Old Tamil are short inscriptions from between the 3rd and 2nd century BC in caves and on pottery. These inscriptions are written in a variant of the Brahmi script called Tamil-Brahmi. The earliest long text in Old Tamil is the Tolkāppiyam, an early work on Tamil grammar and poetics, whose oldest layers could be as old as the 1st century BC. A large number of literary works in Old Tamil have also survived. These include a corpus of 2,381 poems collectively known as Sangam literature. These poems are usually dated to between the 1st and 5th centuries AD. Tamil inscriptions in Vatteluttu script in stone during Chola period c.1000 AD at Brahadeeswara temple in Thanjavur, Tamil Nadu. The evolution of Old Tamil into Middle Tamil, which is generally taken to have been completed by the 8th century, was characterised by a number of phonological and grammatical changes. In phonological terms, the most important shifts were the virtual disappearance of the aytam (ஃ), an old phoneme, the coalescence of the alveolar and dental nasals, and the transformation of the alveolar plosive into a rhotic. In grammar, the most important change was the emergence of the present tense. The present tense evolved out of the verb kil (கில்), meaning "to be possible" or "to befall". In Old Tamil, this verb was used as an aspect marker to indicate that an action was micro-durative, non-sustained or non-lasting, usually in combination with a time marker such as ṉ (ன்). In Middle Tamil, this usage evolved into a present tense marker – kiṉṟa (கின்ற) – which combined the old aspect and time markers. Contact with European languages affected written and spoken Tamil. Changes in written Tamil include the use of European-style punctuation and the use of consonant clusters that were not permitted in Middle Tamil. The syntax of written Tamil has also changed, with the introduction of new aspectual auxiliaries and more complex sentence structures, and with the emergence of a more rigid word order that resembles the syntactic argument structure of English. Simultaneously, a strong strain of linguistic purism emerged in the early 20th century, culminating in the Pure Tamil Movement which called for removal of all Sanskritic elements from Tamil. It received some support from Dravidian parties. This led to the replacement of a significant number of Sanskrit loanwords by Tamil equivalents, though many others remain. 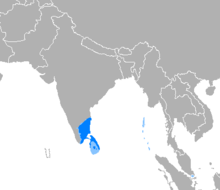 Tamil is the primary language of the majority of the people residing in Tamil Nadu, Puducherry, in India and Northern Province, Eastern Province, in Sri Lanka. The language is spoken among small minority groups in other states of India which include Karnataka, Andhra Pradesh, Kerala, Maharashtra and in certain regions of Sri Lanka such as Colombo and the hill country. Tamil or dialects of it were used widely in the state of Kerala as the major language of administration, literature and common usage until the 12th century AD. Tamil was also used widely in inscriptions found in southern Andhra Pradesh districts of Chittoor and Nellore until the 12th century AD. Tamil was used for inscriptions from the 10th through 14th centuries in southern Karnataka districts such as Kolar, Mysore, Mandya and Bangalore. There are currently sizeable Tamil-speaking populations descended from colonial-era migrants in Malaysia, Singapore, Philippines, Mauritius, South Africa, Indonesia, Thailand, Burma, and Vietnam. A large community of Pakistani Tamils speakers exists in Karachi, Pakistan, which includes Tamil-speaking Hindus as well as Christians and Muslims – including some Tamil-speaking Muslim refugees from Sri Lanka. Many in Réunion, Guyana, Fiji, Suriname, and Trinidad and Tobago have Tamil origins, but only a small number speak the language. In Reunion where the Tamil language was forbidden to be learnt and used in public space by France it is now being relearnt by students and adults. It is also used by groups of migrants from Sri Lanka and India in Canada (especially Toronto), United States (especially New Jersey and New York City), Australia, many Middle Eastern countries, and some European countries. Nameboard with Tamil at Koneswaram temple at Thirukonamalai, Sri Lanka. Tamil is the official language of the Indian state of Tamil Nadu and one of the 22 languages under schedule 8 of the constitution of India. It is one of the official languages of the union territory of Puducherry and the Andaman and Nicobar Islands. Tamil is also one of the official languages of Singapore. Tamil is one of the official and national languages of Sri Lanka, along with Sinhala. It was once given nominal official status in the Indian state of Haryana, purportedly as a rebuff to Punjab, though there was no attested Tamil-speaking population in the state, and was later replaced by Punjabi, in 2010. In Malaysia, 543 primary education government schools are available fully in Tamil medium. The establishments of Tamil medium schools have been currently in process in Myanmar to provide education completely in Tamil language by the Tamils who settled there 200 years ago. Tamil is taught in Canada for the local Tamil minority populations and the month of January has been declared "Tamil Heritage Month" by the Parliament of Canada. Tamil enjoys a special status of protection under Article 6(b), Chapter 1 of the Constitution of South Africa and is taught as a subject in schools in KwaZulu-Natal province. Recently, it has been rolled out as a subject of study in schools in the French overseas department of Réunion. In addition, with the creation in October 2004 of a legal status for classical languages by the Government of India and following a political campaign supported by several Tamil associations, Tamil became the first legally recognised Classical language of India. The recognition was announced by the contemporaneous President of India, Abdul Kalam, in a joint sitting of both houses of the Indian Parliament on 6 June 2004. Jambai Tamil Brahmi inscription near Tirukkoyilur in Villupuram district, Tamil Nadu dated to the early Tamil Sangam age (c. 400 BC). The socio-linguistic situation of Tamil is characterised by diglossia: there are two separate registers varying by socioeconomic status, a high register and a low one. Tamil dialects are primarily differentiated from each other by the fact that they have undergone different phonological changes and sound shifts in evolving from Old Tamil. For example, the word for "here"—iṅku in Centamil (the classic variety)—has evolved into iṅkū in the Kongu dialect of Coimbatore, inga in the dialect of Thanjavur, and iṅkai in some dialects of Sri Lanka. Old Tamil's iṅkaṇ (where kaṇ means place) is the source of iṅkane in the dialect of Tirunelveli, Old Tamil iṅkaṭṭu is the source of iṅkuṭṭu in the dialect of Madurai, and iṅkaṭe in some northern dialects. Even now, in the Coimbatore area, it is common to hear "akkaṭṭa" meaning "that place". Although Tamil dialects do not differ significantly in their vocabulary, there are a few exceptions. The dialects spoken in Sri Lanka retain many words and grammatical forms that are not in everyday use in India, and use many other words slightly differently. 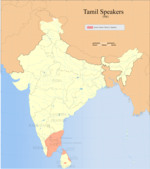 Tamil dialects include Central Tamil dialect, Kongu Tamil, Madras Bashai, Madurai Tamil, Nellai Tamil, Kumari tamil in India and Batticaloa Tamil dialect, Jaffna Tamil dialect, Negombo Tamil dialect in Sri Lanka. Sankethi dialect in Karnataka has been heavily influenced by Kannada. The dialect of the district of Palakkad in Kerala has a large number of Malayalam loanwords, has been influenced by Malayalam's syntax, and has a distinctive Malayalam accent. Similarly, Tamil spoken in Kanyakumari District has more unique words and phonetic style than Tamil spoken at other parts of Tamil Nadu. The words and phonetics are so different that a person from Kanyakumari district is easily identifiable by their spoken Tamil. Hebbar and Mandyam dialects, spoken by groups of Tamil Vaishnavites who migrated to Karnataka in the 11th century, retain many features of the Vaishnava paribasai, a special form of Tamil developed in the 9th and 10th centuries that reflect Vaishnavite religious and spiritual values. Several castes have their own sociolects which most members of that caste traditionally used regardless of where they come from. It is often possible to identify a person's caste by their speech. Tamil in Sri Lanka incorporates loan words from Portuguese, Dutch, and English. Literary Tamil pronunciation. Reading an excerpt from Ma. Po. Si. 's book 'Arivuk kadhaigal' (1900s). Literary Tamil pronunciation in song written by Subramanya Bharathi, 'Senthamizh naadennum pothinile' (1900s ). In modern times, centamiḻ is generally used in formal writing and speech. For instance, it is the language of textbooks, of much of Tamil literature and of public speaking and debate. In recent times, however, koṭuntamiḻ has been making inroads into areas that have traditionally been considered the province of centamiḻ. Most contemporary cinema, theatre and popular entertainment on television and radio, for example, is in koṭuntamiḻ, and many politicians use it to bring themselves closer to their audience. The increasing use of koṭuntamiḻ in modern times has led to the emergence of unofficial ‘standard' spoken dialects. In India, the ‘standard' koṭuntamiḻ, rather than on any one dialect, but has been significantly influenced by the dialects of Thanjavur and Madurai. In Sri Lanka, the standard is based on the dialect of Jaffna. Historical evolution of Tamil writing from the earlier Tamil Brahmi near the top to the current Tamil script at bottom. After Tamil Brahmi fell out of use, Tamil was written using a script called vaṭṭeḻuttu amongst others such as Grantha and Pallava. The current Tamil script consists of 12 vowels, 18 consonants and one special character, the āytam. The vowels and consonants combine to form 216 compound characters, giving a total of 247 characters (12 + 18 + 1 + (12 x 18)). All consonants have an inherent vowel a, as with other Indic scripts. This inherent vowel is removed by adding a tittle called a puḷḷi, to the consonantal sign. For example, ன is ṉa (with the inherent a) and ன் is ṉ (without a vowel). Many Indic scripts have a similar sign, generically called virama, but the Tamil script is somewhat different in that it nearly always uses a visible puḷḷi to indicate a 'dead consonant' (a consonant without a vowel). In other Indic scripts, it is generally preferred to use a ligature or a half form to write a syllable or a cluster containing a dead consonant, although writing it with a visible virama is also possible. The Tamil script does not differentiate voiced and unvoiced plosives. Instead, plosives are articulated with voice depending on their position in a word, in accordance with the rules of Tamil phonology. In addition to the standard characters, six characters taken from the Grantha script, which was used in the Tamil region to write Sanskrit, are sometimes used to represent sounds not native to Tamil, that is, words adopted from Sanskrit, Prakrit and other languages. The traditional system prescribed by classical grammars for writing loan-words, which involves respelling them in accordance with Tamil phonology, remains, but is not always consistently applied. ISO 15919 is an international standard for the transliteration of Tamil and other Indic scripts into Latin characters. It uses diacritics to map the much larger set of Brahmic consonants and vowels to the Latin script. Tamil can be transliterated into English by using ISO 15919, since English language uses the Latin script for writing. Tamil phonology is characterised by the presence of retroflex consonants and multiple rhotics. Tamil does not distinguish phonologically between voiced and unvoiced consonants; phonetically, voice is assigned depending on a consonant's position in a word. Tamil phonology permits few consonant clusters, which can never be word initial. Native grammarians classify Tamil phonemes into vowels, consonants, and a "secondary character", the āytam. Tamil consonants are presented as hard, soft and medial in some grammars which roughly corresponds to plosives, nasals and approximants. Unlike most Indian languages, Tamil does not distinguish aspirated and unaspirated consonants. In addition, the voicing of plosives is governed by strict rules in centamiḻ. Plosives are unvoiced if they occur word-initially or doubled. Elsewhere they are voiced, with a few becoming fricatives intervocalically, which means that voicing is not a phonological trait for plosives. Nasals and approximants are always voiced. Tamil is characterised by its use of more than one type of coronal consonants: like many of the other languages of India, it contains a series of retroflex consonants. Notably, the Tamil retroflex series includes the retroflex approximant /ɻ/ (ழ) (example Tamil; often transcribed 'zh'), which is absent in the Indo-Aryan languages. Among the other Dravidian languages, the retroflex approximant also occurs in Malayalam (for example in 'Kozhikode'), disappeared from spoken Kannada around 1000 AD (although the character is still written, and exists in Unicode, ೞ as in ಕೊೞೆ), and was never present in Telugu. In many dialects of colloquial Tamil, this consonant is seen as disappearing and shifting to the alveolar lateral approximant /l/. Dental and alveolar consonants also historically contrasted with each other, a typically Dravidian trait not found in the neighbouring Indo-Aryan languages. While this distinction can still be seen in the written language, it has been largely lost in colloquial spoken Tamil, and even in literary usage the letters ந (dental) and ன (alveolar) may be seen as allophonic. Likewise, the historical alveolar stop has transformed into a trill consonant in many modern dialects. Classical Tamil had a phoneme called the āytam, written as ‘ஃ'. Tamil grammarians of the time classified it as a dependent phoneme (or restricted phoneme) (cārpeḻuttu), but it is very rare in modern Tamil. The rules of pronunciation given in the Tolkāppiyam, a text on the grammar of Classical Tamil, suggest that the āytam could have glottalised the sounds it was combined with. It has also been suggested that the āytam was used to represent the voiced implosive (or closing part or the first half) of geminated voiced plosives inside a word. The āytam, in modern Tamil, is also used to convert p to f when writing English words using the Tamil script. Tamil employs agglutinative grammar, where suffixes are used to mark noun class, number, and case, verb tense and other grammatical categories. Tamil's standard metalinguistic terminology and scholarly vocabulary is itself Tamil, as opposed to the Sanskrit that is standard for most Aryan languages. Person and number are indicated by suffixing the oblique case of the relevant pronoun. The suffixes to indicate tenses and voice are formed from grammatical particles, which are added to the stem. Tamil is a null-subject language. Not all Tamil sentences have subjects, verbs, and objects. It is possible to construct grammatically valid and meaningful sentences which lack one or more of the three. For example, a sentence may only have a verb—such as muṭintuviṭṭatu ("completed")—or only a subject and object, without a verb such as atu eṉ vīṭu ("That [is] my house"). Tamil does not have a copula (a linking verb equivalent to the word is). The word is included in the translations only to convey the meaning more easily. The vocabulary of Tamil is mainly Dravidian. A strong sense of linguistic purism is found in Modern Tamil, which opposes the use of foreign loanwords. Nonetheless, a number of words used in classical and modern Tamil are loanwords from the languages of neighbouring groups, or with whom the Tamils had trading links, including Munda (for example, tavaḷai "frog" from Munda tabeg), Malay (e.g. cavvarici "sago" from Malay sāgu), Chinese (for example, campān "skiff" from Chinese san-pan) and Greek (for example, ora from Greek ὥρα). In more modern times, Tamil has imported words from Urdu and Marathi, reflecting groups that have influenced the Tamil area at times, and from neighbouring languages such as Telugu, Kannada, and Sinhala. During the modern period, words have also been adapted from European languages, such as Portuguese, French, and English. The strongest impact of purism in Tamil has been on words taken from Sanskrit. During its history, Tamil, along with other Dravidian languages like Telugu, Kannada, Malayalam etc., was influenced by Sanskrit in terms of vocabulary, grammar and literary styles, reflecting the increased trend of Sanskritisation in the Tamil country. Tamil vocabulary never became quite as heavily Sanskritised as that of the other Dravidian languages, and unlike in those languages, it was and remains possible to express complex ideas (including in science, art, religion and law) without the use of Sanskrit loan words. In addition, Sanskritisation was actively resisted by a number of authors of the late medieval period, culminating in the 20th century in a movement called taṉit tamiḻ iyakkam (meaning "pure Tamil movement"), led by Parithimaar Kalaignar and Maraimalai Adigal, which sought to remove the accumulated influence of Sanskrit on Tamil. As a result of this, Tamil in formal documents, literature and public speeches has seen a marked decline in the use Sanskrit loan words in the past few decades, under some estimates having fallen from 40–50% to about 20%. As a result, the Prakrit and Sanskrit loan words used in modern Tamil are, unlike in some other Dravidian languages, restricted mainly to some spiritual terminology and abstract nouns. Words of Tamil origin occur in other languages. A notable example of a word in worldwide use with Dravidian (not specifically Tamil) etymology is orange, via Sanskrit nāraṅga from a Dravidian predecessor of Tamil nartaṅkāy "fragrant fruit". One suggestion as to the origin of the word anaconda is the Tamil anaikkonda, "having killed an elephant". Examples in English include cheroot (churuṭṭu meaning "rolled up"), mango (from māngāi), mulligatawny (from miḷaku taṇṇīr, "pepper water"), pariah (from paraiyan), curry (from kari), and catamaran (from kaṭṭu maram, "bundled logs"), congee (from kanji – rice porridge or gruel). ^ "Report of the Commissioner for Linguistic Minorities in India: 50th report (delivered to the Lokh Sabha in 2014)" (PDF). National Commissioner for Linguistic Minorities, Ministry of Minority Affairs, Government of India. p. 155. Archived from the original (PDF) on 8 July 2016. Retrieved 8 June 2017. ^ "Languages in Andaman and Nicobar Islands". Retrieved 7 August 2017. ^ "Constitution of the Republic of South Africa, 1996 – Chapter 1: Founding Provisions". www.gov.za. South African Government. ^ "Languages of ASEAN". Retrieved 7 August 2017. ^ Hammarström, Harald; Forkel, Robert; Haspelmath, Martin, eds. (2017). "Tamil". Glottolog 3.0. Jena, Germany: Max Planck Institute for the Science of Human History. ^ Hammarström, Harald; Forkel, Robert; Haspelmath, Martin, eds. (2017). "Old Tamil". Glottolog 3.0. Jena, Germany: Max Planck Institute for the Science of Human History. ^ Tamil Schools. Indianmalaysian.com. Retrieved 28 July 2013. ^ Ghazali, Kamila (2010). UN Chronicle – National Identity and Minority Languages. United Nations. ^ a b Stein, B. (1977). "Circulation and the Historical Geography of Tamil Country". The Journal of Asian Studies. 37 (1): 7–26. doi:10.2307/2053325. JSTOR 2053325. ^ Zvelebil 1992, p. 12: "...the most acceptable periodisation which has so far been suggested for the development of Tamil writing seems to me to be that of A Chidambaranatha Chettiar (1907–1967): 1. Sangam Literature – 200BC to AD 200; 2. Post Sangam literature – AD 200 – AD 600; 3. Early Medieval literature – AD 600 to AD 1200; 4. Later Medieval literature – AD 1200 to AD 1800; 5. Pre-Modern literature – AD 1800 to 1900"
^ Abraham, S. A. (2003). "Chera, Chola, Pandya: Using Archaeological Evidence to Identify the Tamil Kingdoms of Early Historic South India". Asian Perspectives. 42 (2): 207. doi:10.1353/asi.2003.0031. hdl:10125/17189. ^ a b "Tamil Brahmi script in Egypt". The Hindu. 21 November 2007. Retrieved 5 January 2015. ^ Mahadevan, Iravatham (24 June 2010). "An epigraphic perspective on the antiquity of Tamil". The Hindu. Chennai, India. ^ Karthik Madhavan (2010-06-20). "Tamil saw its first book in 1578". The Hindu. ^ Kolappan, B. (22 June 2014). "Delay, howlers in Tamil Lexicon embarrass scholars". The Hindu. Chennai. Retrieved 25 December 2014. ^ Sivathamby, K (1974). "Early South Indian Society and Economy: The Tinai Concept". Social Scientist. 3 (5): 20–37. doi:10.2307/3516448. JSTOR 3516448. ^ "Scroll.in – News. Politics. Culture". scroll.in. ^ Ramaswamy 1997: "Dravidianism, too, lent its support to the contestatory classicist project, motivated principally by the political imperative of countering (Sanskritic) Indian nationalism... It was not until the DMK came to power in 1967 that such demands were fulfilled, and the pure Tamil cause received a boost, although purification efforts are not particularly high on the agenda of either the Dravidian movement or the Dravidianist idiom of tamiḻppaṟṟu." ^ "Statement by the Prime Minister of Canada on Thai Pongal". 13 January 2017. ^ "Canada officially declares pride in its Tamils, passes Bill calling for Tamil Heritage Month". The News Minute. 8 October 2016. Retrieved 6 August 2017. ^ "Constitutional Court of South Africa – The Constitution". www.constitutionalcourt.org.za. Retrieved 5 August 2017. ^ "Five Indian languages reinstated as official subjects in South African schools". Jagranjosh.com. 21 March 2014. Retrieved 6 August 2017. ^ "For these islanders, a reunion with Tamil". The Hindu. Retrieved 6 August 2017. ^ Dutta, Sujan (28 September 2004), "Classic case of politics of language", The Telegraph, Kolkata, India, retrieved 20 April 2007, Members of the committee felt that the pressure was being brought on it because of the compulsions of the Congress and the UPA government to appease its ally, M. Karunanidhi's DMK. ^ India sets up classical languages. BBC. 17 August 2004. ^ "Sanskrit to be declared classical language". The Hindu. 28 October 2005. ^ Steever, S. B.; Britto, F. (1988). "Diglossia: A Study of the Theory, with Application to Tamil". Language. 64 (1): 152–155. doi:10.2307/414796. JSTOR 414796. ^ Zvelebil, K. (1966). "Some features of Ceylon Tamil". Indo-Iranian Journal. 9 (2): 113. doi:10.1163/000000066790086440. ^ Schiffman, Harold (1997). "Diglossia as a Sociolinguistic Situation", in Florian Coulmas (ed. ), The Handbook of Sociolinguistics. London: Basil Blackwell, Ltd. pp. 205 ff. ^ a b Schiffman, Harold (1998), "Standardization or restandardization: The case for 'Standard' Spoken Tamil", Language in Society, 27 (3): 359–385, doi:10.1017/S0047404598003030. ^ Fowler, Murray (1954). "The Segmental Phonemes of Sanskritized Tamil". Language. 30 (3): 360–367. doi:10.2307/410134. JSTOR 410134. at p. 360. ^ Caldwell, Robert (1875). Classes of nouns in Tamil. Retrieved 1 June 2007. ^ Zvelebil, K. V. (April–June 1972). "Dravidian Case-Suffixes: Attempt at a Reconstruction". Journal of the American Oriental Society. 92 (2): 272–276. doi:10.2307/600654. JSTOR 600654. The entire problem of the concept of "case" in Dravidian will be ignored in this paper. In fact, we might posit a great number of "cases" for perhaps any Dravidian language once we departed from the familiar types of paradigms forced upon us by traditional, indigenous and European grammars, especially of the literary languages. It is, for instance, sheer convention based on Tamil grammatical tradition (influenced no doubt by Sanskrit) that, as a rule, the number of cases in Tamil is given as eight. ^ Ramaswamy, S. (2009). "En/gendering Language: The Poetics of Tamil Identity". Comparative Studies in Society and History. 35 (4): 683. doi:10.1017/S0010417500018673. ^ Krishnamurti 2003, p. 480. ^ "Literature in all Dravidian languages owes a great deal to Sanskrit, the magic wand whose touch raised each of the languages from a level of patois to that of a literary idiom" (Sastri 1955, p. 309); Trautmann, Thomas R. (2006). Languages and nations: the Dravidian proof in colonial Madras. Berkeley: University of California Press. "The author endeavours to demonstrate that the entire Sangam poetic corpus follows the "Kavya" form of Sanskrit poetry" – Tieken 2001, p. 18. ^ Vaidyanathan, S. (1967). "Indo-Aryan Loan Words in the Cīvakacintāmaṇi". Journal of the American Oriental Society. 87 (4): 430–434. doi:10.2307/597587. JSTOR 597587. ^ See Ramaswamy's analysis of one such text, the Tamiḻ viṭututu, in Ramaswamy, S. (1998). "Language of the People in the World of Gods: Ideologies of Tamil before the Nation". The Journal of Asian Studies. 57 (1): 66–92. doi:10.2307/2659024. JSTOR 2659024. ^ Ramaswamy, Sumathy (1997), "Laboring for language", Passions of the Tongue: Language Devotion in Tamil India, 1891–1970, Berkeley: University of California Press, ISBN 978-0-585-10600-7, Nevertheless, even impressionistically speaking, the marked decline in the use of foreign words, especially of Sanskritic origin, in Tamil literary, scholarly, and even bureaucratic circles over the past half century is quite striking. ^ “Origin and Meaning of Anaconda.” Online Etymology Dictionary. Fabricius, Johann Philip (1933 and 1972), Tamil and English Dictionary. based on J.P. Fabricius Malabar-English Dictionary, 3rd and 4th Edition Revised and Enlarged by David Bexell. Evangelical Lutheran Mission Publishing House, Tranquebar; called Tranquebar Dictionary.